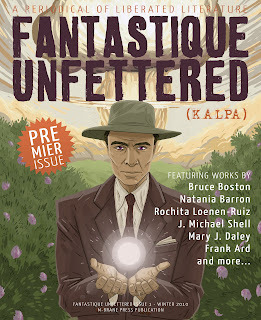 The inaugural issue of our beautiful new fantasy quarterly Fantastique Unfettered is officially released in print today. 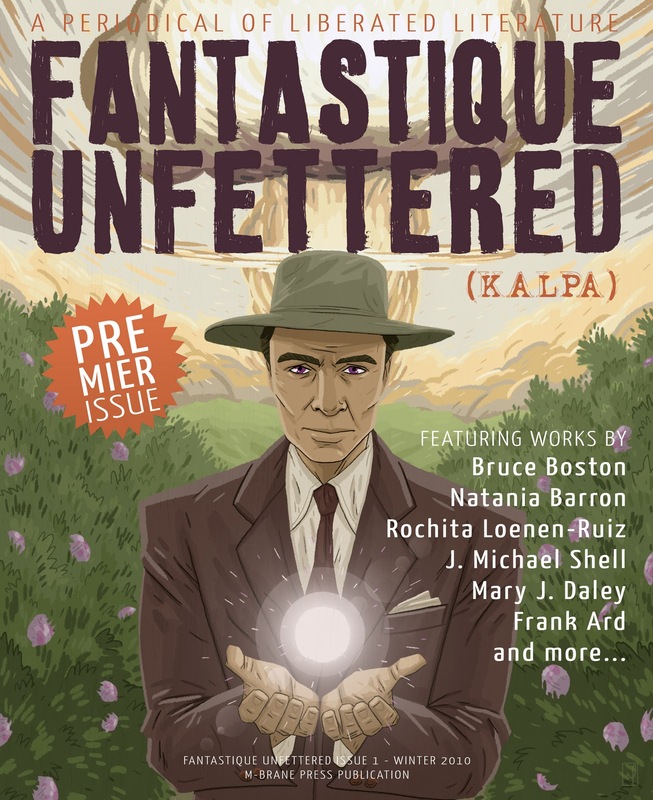 Edited by Brandon H. Bell (Aether Age co-creator and M-Brane contributor), FU is a "Periodical of Liberated Literature," all of its content released under a Creative Commons license. As such, we think it is probably unique, and we know of nothing else quite like it. As a physical object, FU #1 is a delight to hold in one's hands. It's lovingly designed and full of terrific artwork to compliment the really amazing writing (11 items fiction and three poems). We're using a new printer and distribution system for this first edition of FU, and its availability will probably trickle through the system gradually over the next few days, but it is available right now on the Barnes & Noble site with a sweet discount. Our cover price is $9.95, but it can be had on B&N for $7.01. We can't even sell it that cheaply directly, so we are encouraging everyone to get over there and grab it up. We do not have ebook versions available yet, but will have news of that forthcoming reasonably soon. Please visit the FU site for more information on the magazine, its content and philosophy.